Fiesta time! 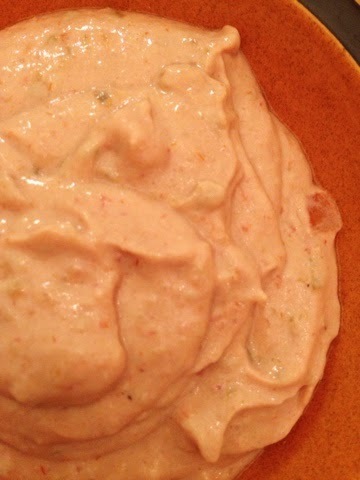 : Simple Salsa Cream Dip. I've been feeling very hyper all day today...not sure what from, but hey--I'M NOT COMPLAINING! I love being randomly hyper...it may or may not happen frequently...🙊💃 anyway, whenever I'm hyper I crave spicy foods...I guess to make me more hyper?! Or to go WITH my hyperness...I don't know. But it always happens haha! Spicy + Creamy = Perfection. 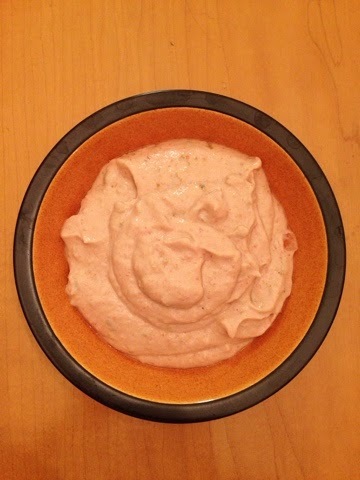 Simple Salsa Cream Dip; Vegan, Gluten-free. Serves one. 1. Add all ingredients to your mini food processor and blend until smooth. 2. Serve with raw veggies, homemade corn chips, you name it. Enjoy! Told you it was simple. This. Is. Amazing. That. Is. All. GO MAKE THIS NOW! 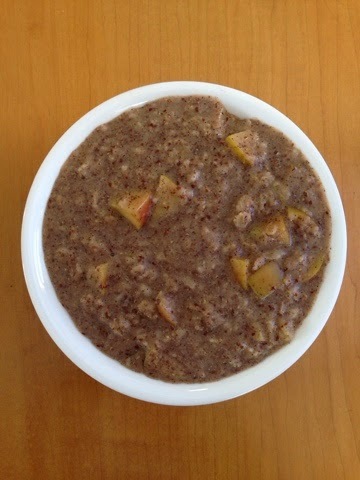 Apple Pie Oatmeal; Vegan, Gluten-free. Serves one. 1. 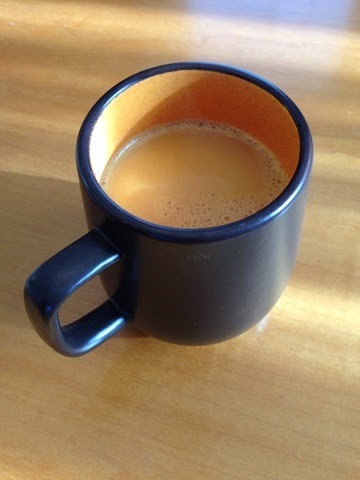 Bring almond milk to a boil, and reduce heat to medium. 2. 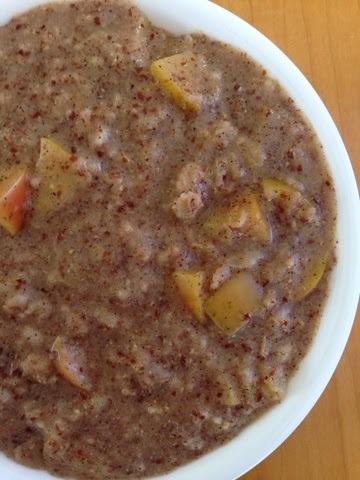 In a bowl, mix oats, flax, and spices. Add to almond milk and stir well. When beginning to thicken, add chopped Apple, water, and applesauce. Turn heat to high, and cook 15 minutes, stirring constantly (and watching for splatters!! ), until desired thickness is reached. Sweet 'n Sour Spaghetti Pasta Salad. This kind of goes without saying, but I LOOOVE taking traditional recipes (pasta salad, for example!) and putting a totally weird spin on them. It's so fun to come up with creative flavor combinations, and even MORE fun to EAT it afterwards! Nothing better 😄 this is a really fun recipe--super colorful, too! Nice and quick, tastes super fresh, and can be made ahead (and taken to a picnic!). The use of spaghetti noodles really makes this recipe awesome. Most pasta salads use bow tie, macaroni, fusilli, shells, you get the point. But...I'm not most 🙌😂 hope you enjoy! Sweet 'n Sour Spaghetti Pasta Salad! Sweet 'n Sour Spaghetti Pasta Salad; Vegan, Gluten-free. Serves one. 1. In a large bowl or on a large plate, arrange your chopped spinach. Place cooled spaghetti noods on top. 2. 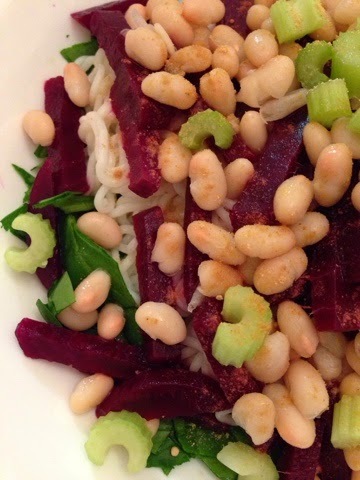 Top noodles with beets, then beans, then celery. 3. In a small bowl, vigorously whisk vinegar and stevia to make a Vinagrette. Pour over pasta salad, and top with ginger. Enjoy! Note: I actually rink this tastes better if you let it sit for a while...it will begin to marinate and absorb the Vinagrette...yum! Everything's better when it's pink! 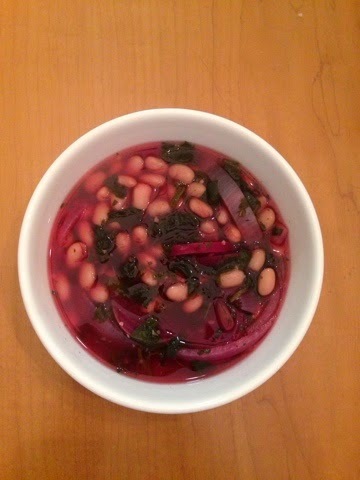 Pink Lady Stew! ; Vegan, Gluten-free. Serves one. 1. Sauté onion and garlic in 1/3 cup water until soft. Add nutmeg and stir. Cook 2 minutes. 2. 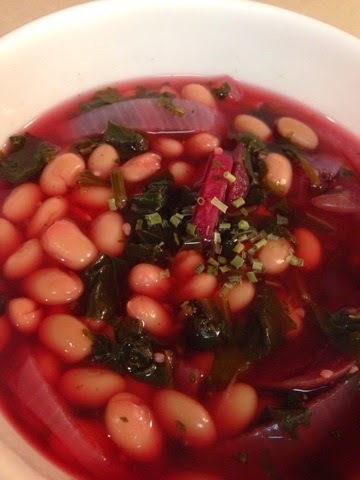 Add rest of water, ACV, white beans, stevia, and spinach. Bring to a boil, and simmer for 5-10 minutes. 3. Add beets and mix well. Simmer 5-10 more minutes, until water turns a bright pink. 4. 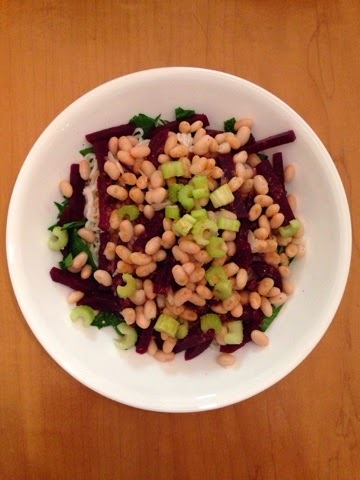 Serve in a large bowl, and garnish with chopped chives. Sweet 'n Spicy Banana Bread Oatmeal! Will this winter ever end?! It really feels like not....😭😭😭 I'm cold-natured (which is precisely why I'm a figure skater...? Haha! I'm so silly! ), so this weather is literally killing me: today is the first day ALL WEEK that the temps have been above 22 degrees. NO I AM NOT KIDDING. YES I STILL LIVE IN VIRGINIA...aka the SOUTH where it's supposed to be WARM. Lol. Sweet 'n Spicy Banana Bread Oatmeal. 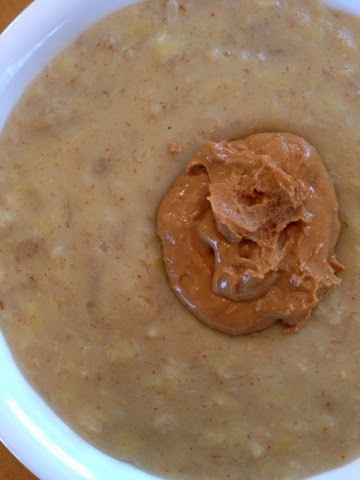 Topped with PB...but of course! Sweet 'n Spicy Banana Bread Oatmeal! ; Vegan, Gluten-free. Serves one. 1. In a small pot on the stove, bring your almond milk to a boil. 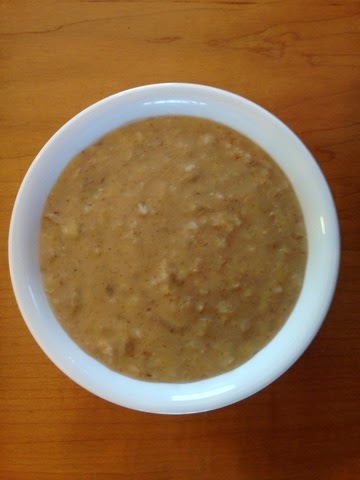 Remove from burner, reduce heat to medium, stir in oats, and return to heat. 2. When beginning to thicken, add sliced banana, cayenne, and water. Cook, stirring constantly, until thickened to desired consistency. Raw Goodness: TFVG's Asian Glow Bowl. This glow bowl is super easy, and super DUPER tasty--I just used what I had on hand...you do the same! TFVG's Asian Glow Bowl; Vegan, Gluten-free option. Serves one. 1. Prepare your veg and arrange as desired on a large plate. 2. In your mini food processor, combine chickpeas, tofu, aminos, and spices with 3-4 T water. 3. Blend until perfectly smooth and creamy, scraping sides periodically throughout blending. 4. 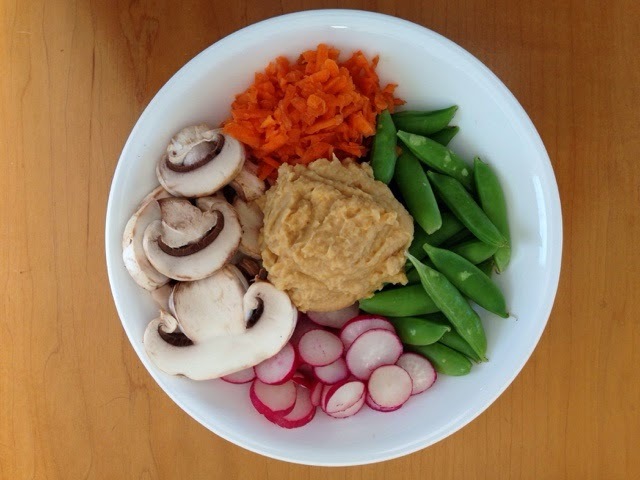 Serve hummus in the center of veggie bowl. Serve with Pitas for dipping. I am in the midst of a SNOW DAY today! And boy, is it--we got a whopping 10 INCHES! Yucky haha. Although I'm not into snow or cold weather, I AM into warm and comforting drinks like this Cinnamon Turmeric Spice Latte...mhmm...and snuggling into the couch with this latte and a good book?! Sounds like a perfect day to me...whether there's snow on the ground or not! Enjoy lovies! Cinnamon Turmeric Spice Latte; Vegan, Gluten-free. Serves one. 1. In a small pot on the stove, combine all ingredients over high heat and whisk vigorously. 2. Bring to a boil, whisk well, and pour into mug. Enjoy! So, if you're anything like me, you tend to overbuy strawberries around Valentine's Day...if this is you, too, then this recipe is your dream come true! It's a PERFECT post-Valentine's day Brek...you can enjoy the fact that you are cleaning out your fridge while devouring this goodness! Sounds like a match made in heaven to me! 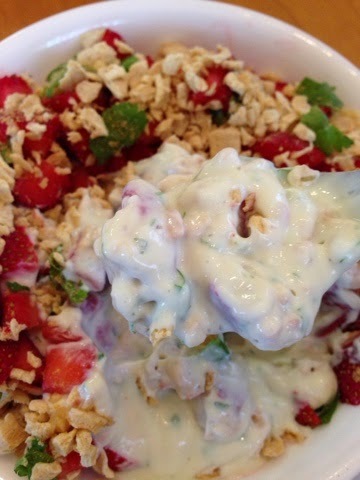 Strawberry Cilantro Nogurt Mess; Vegan, Gluten-free. Serves one. 1. Combine ingredients 1-4 in your mini food processor and blend until smooth. 2. 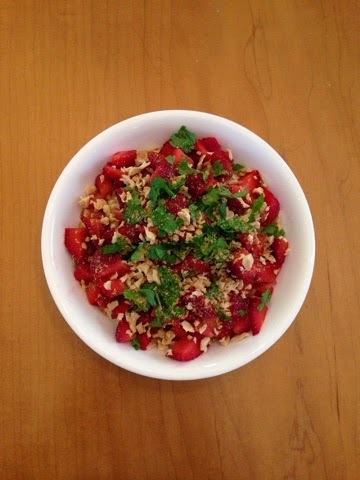 Place in bowl and top with strawbs, gRAWnola, cilantro, and ground ginger. Serve! Holiday Oats! 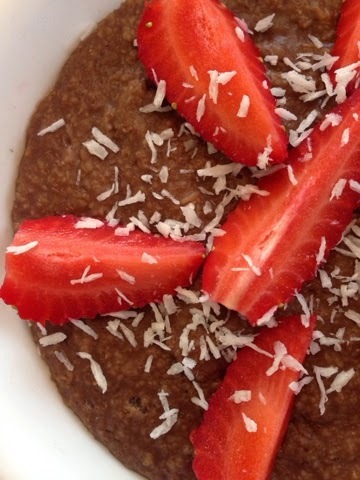 : Valentine's Day Oatmeal. 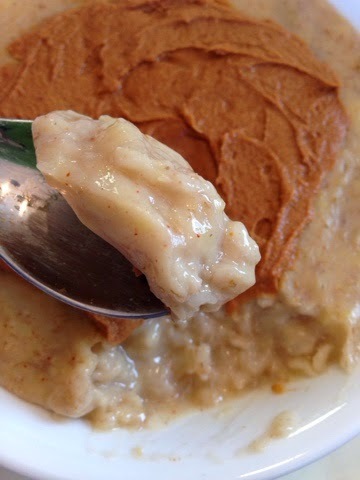 Valentine's Day Oatmeal; Vegan, Gluten-free. Serves one. 1. 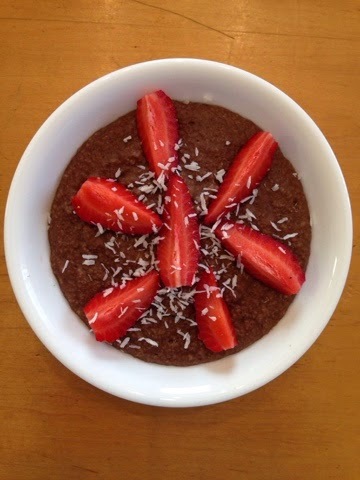 Combine oats and carob/cocoa in a bowl and mix well. 2. In a small pot, bring a mind milk to a rolling boil. When boiling, reduce heat to medium, and add oat/carob mix off of heat. Whisk vigorously. 3. Return to hear and add water and stevia. Stir frequently, cooking until desired consistency is reached. 4. 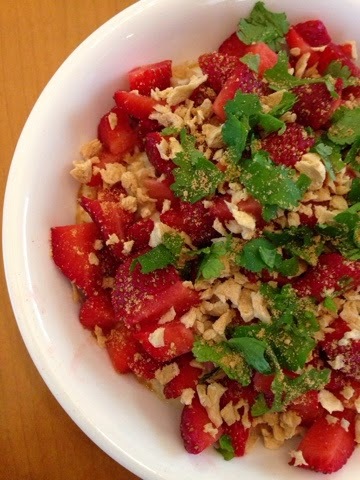 Top with sliced strawberries and coconut shreds. Serve hot. Enjoy!